The Wobage Gallery opens for the season this weekend Saturday 5th March 10am, with a one day only bargain sale of seconds and old stock. Pots by Patia Davis, Sheila Herring, Petra Reynolds and Jeremy Steward and a few baskets from Clyde Hoare. DONT’ MISS IT, ONE DAY ONLY. 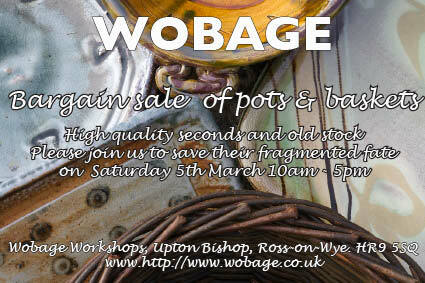 Wobage Gallery is then open for the season, Thursday, Friday and Saturday 10am-5pm.